Navaratri – the 9 nights of goddess symbolizes the nine nights of war between Goddess Durga and Mahishasura, which commemorates the victory of good over evil. Every year during the months of September and October, we celebrate the descent of the Supreme Goddess to the Earth plane. The various forms of Ma Durga are worshipped with great dedication and devotion on these 9 days. The 3 dominant Goddess’ categories worshipped on Navratri are Durga, Lakshmi, and Saraswati and they share three nights of the nine nights of the Goddesses each. The nine nights are dedicated to three aspects of the Goddess in their fierce forms with multiple hands and multiple psychic weapons. This year Navaratri is special because Radha, called Paralakshmi (Para means Supreme), is descending onto the earth plane to start the Golden Age. Paralakshmi, the Supreme Goddess, during Navaratri 2011 will be reclaiming her place, who has been dormant for so many yugas and now is exercising her right to get into world and transform it. Navaratri 2011 will awaken the Earth from a slumber. This is a Fight for Light that is led now by Goddess Paralakshmi, who embodies All Divine Feminine Power. The main idea behind Navaratri is to cleanse our own evil characteristics and to understand that each of the negative human qualities exists in the form of demons, externally in the invisible sphere. The killing of the demons by the Goddesses takes place annually, which is astrologically and astronomically significant. The 9 Nights of Fierce Fighting produce an accumulative effect as each Goddess takes her turn to fight the battle for different aspects of ultimate perfection inside and out. The battle ends in victory as the demons are slayed on the 9th night. Goddess Durga or Ma Durga destroys all of our impurities, vices, defects and gains us purity and perfection. As per Vedic Astrology, Ma Durga is the overlord of planet Rahu and Her energy counteracts the negative influences of Rahu. 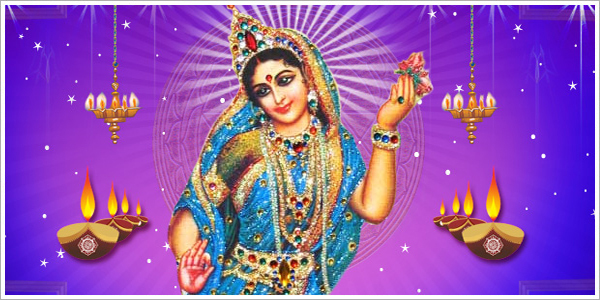 Goddess Lakshmi or Ma Lakshmi destroys the demon of poverty and grant inexhaustible wealth and abundance. As per Vedic Astrology, Goddess Lakshmi is the overlord of the planet Venus and She brings pleasures, comforts and fun into your life. Goddess Saraswati or Ma Saraswati destroys the demon of ignorance and grants us knowledge and divine wisdom. While Saraswati is not the overlord of any planet, Her energy is essential for discrimination, academics and to perform well in artistic pursuits. Celebrate the Descent of the Supreme Goddess to the Earth Plane with Astroved!